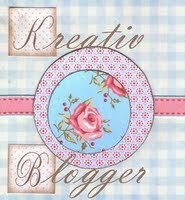 Someone Gave me the Kreativ Blogger Award! I had a bad week last week. My dog was having health issues, waking me up every 2 hours to go to the bathroom, for almost a week. She’s doing much better now. Unbeknownst to me, Earline Hines of the Ancestral Notes blog, gave me the Kreativ Blogger Award! Earline, I wasn’t ignoring you. I just don’t do very well on 1 1/2 to 2 hours sleep a night (you parents know what I’m talking about!). I want to thank Earline for this award. I’ve worked hard on the Research Journal blog and I’m glad that others find something useful in what I write. Once you receive the Kreativ Blogger award you’re supposed to pass on the good cheer. Stop by a read these blogs! I’m humbled that you passed this award on to me. Typically these things are received by someone that I’ve already “met” on line and someone that I have a lot of communication with. How did you come to find my little blog? I’m not a facebook user, never have I been listed in Geneabloggers new blogs of the week – how really did you come across my ramblings? Thanks so much for passing this along to me. While I have already received it from a “friend” it feels good to know that someone else out there is reading! No need to apologize, Donna. We do have lives outside of blogging, great blog.